When you hear the word hero, who do you think of? Maybe you envision your favorite super-hero like Superman or Batman. A victim in distress cries out for help, and just in the nick of time, the hero steps in to save the day. Or maybe you think of policemen, fire fighters or soldiers rescuing people in an emergency. I agree that all of the above fit the description of hero, but today I put the spotlight on someone else… My brother, Jeff. For those who don’t know him, he is the epitome of a servant leader. He always puts others’ needs ahead of his own. He loves with actions and not just mere words. He recently went above and beyond the command to love others. Jesus commands us to love our neighbor and goes on to say that our neighbor is anyone in need. Jeff’s brother-in-law,Chris, had a very desperate need. Fighting against the disease of diabetes, Chris stood at a critical crossroad recently. Functioning only at 15%, his kidneys were failing miserably. He was to the point that unless he had a kidney transplant, he’d have to begin dialysis immediately. Unless a family member or friend was an exact match, his name would be added at the bottom of a long waiting list. Enter our hero, Jeff. Just in the nick of time. He saved the day. He didn’t step in to fight anyone. He stepped up to fight for someone. He was a perfect match to donate one of his kidneys to Chris. When you hear the word donate, maybe you think of someone writing a check to their favorite charity. Maybe you think of digging through your closet to give outgrown clothes to Goodwill. But donate takes on a much deeper meaning when you give a part of your body to someone else so they can live. There is no physical pain in writing a check. There is no physical pain in giving away household items. But having your body cut open and a surgeon removing an organ? This involved physical pain. It’s a pain I can’t identify with. But for a short time just two days after the surgery, I got only a tiny glimpse of my brother’s pain. It seemed that merely breathing was painful to him as he sat propped up in a chair, hardly able to keep his eyes open (even with a football game on TV). Witnessing this moment brought tears to my eyes. Tears of JOY for seeing up close what real love looks like. I can’t think of a better example of sacrificial giving. An example of selfless love. Love in its purest form. We live in a society where the word love is used so flippantly. Many people say they love someone, yet it’s all about what the other person can do for them. This false love is manipulation in disguise to satisfy selfish desires. True love goes way beyond this. True love gives freely with no thought of self. True love doesn’t have strings attached. Jeff didn’t give Chris his kidney to get something in return or to manipulate him. 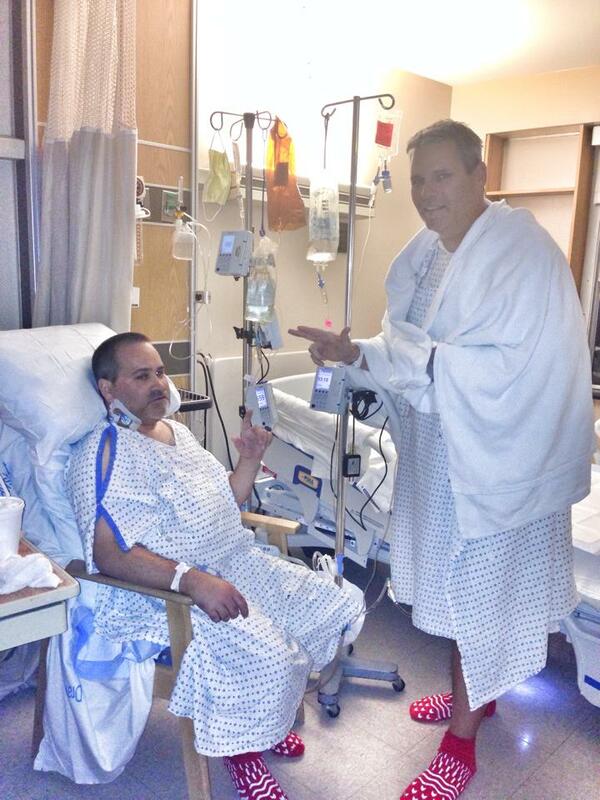 Jeff gave his kidney to Chris because of love. Period. Nothing else. Just pure love. A love that says I care enough about you to give you a better quality of life. A love that says I sacrificially give part of myself to you. A love that says despite the pain, you can count on me. So how can someone love like this? Where does this kind of love come from? It comes from God above–who demonstrated unconditional love to us when Jesus hung on a cross. He endured our pain knowing that in the long run, it would give us hope, a new life and a fierce passion to love others like He did. And when we love deeply like this, it points others to Jesus. This is the kind of love He calls us to give. I’ve never been more proud of my brother. It doesn’t surprise me that he did this. This is just who he is. He’s a real hero in my eyes. Jeff doesn’t like to be in the spotlight, but the reason I can truly call him a hero is because of the inner light permeating from the core of his heart. That light is a reflection from his hero…..Jesus. Please pray for continued healing for both Chris (left) and Jeff (right). ← I Want an Exact Answer!! Lisa: If words could actually describe Jeff, you have penned the perfect description. To see Jeff go through all this pain and suffering just because he could and just because he is the man that he is brings tears to my eyes and my heart overflows with love and respect for him. He and Chris are perfect examples of being who God planned for them to be. Thank you for sharing this with the world because the world needs to know that there are good people still here. Love you and your family so much! Thanks for your comment JoAnn! It has been such a blessing to see God’s hand in all of this! Love you guys! This is beautiful, Lisa. I can fully feel the real love your brother has for God through what you’ve shared, and I’m glad you even shared the pain of his sacrifice. And you’re right. True love isn’t the stuff our society is dishing out these days, like fast food restaurant slogans that say “I’m lovin’ it” when love has nothing to do with it. Your point about it being for manipulation hits the situation dead on. Really great share here. Thanks for your comment, Crystal! I feel honored to be able to write about such an amazing thing my brother did.